Clarity Media is a creator and supplier of nurikabe puzzles, which can also be displayed online as well as in traditional print media. We can supply nurikabe puzzles in a variety of grid sizes. Nurikabe is a Japanese puzzle that is not particularly common, and therefore it is best used in a compilation of Japanese puzzles rather than an entire set of nurikabe published on its own as there is a good chance quite a few of your readers will not have come across this puzzle type before. 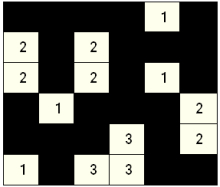 It is a pure logic puzzle, and the puzzle starts with a rectangular grid with some numbers placed. These numbers indicate the size of an island that floats (symbolically) in a filled sea. Thus if there is a '4' marked, then you know that cell comprises four cells, including the marked cell, and you must be able to move horizontally or vertically from any cell to any other cell within an island. There is no restriction on the number of cells in an island or how those cells are arranged, as long as the rule above is not broken. No islands can touch each other at all horizontally or vertically, and all the sea is connected. The sea cannot have a 2x2 square or greater, in other words if there is a chance of this happening then an island must come into one of the squares to prevent that occurrence. Nurikabe can be solved through logic alone and each puzzle has one solution. Publishers - Please contact us to buy Nurikabe puzzles for publication in your book, magazine, newspaper, any other printed media or online.